Pork tinola is almost the same as nilagang baboy or boiled pork with vegetables. The method of cooking are both similar, boiling the meat until tender then adding in the vegetables. 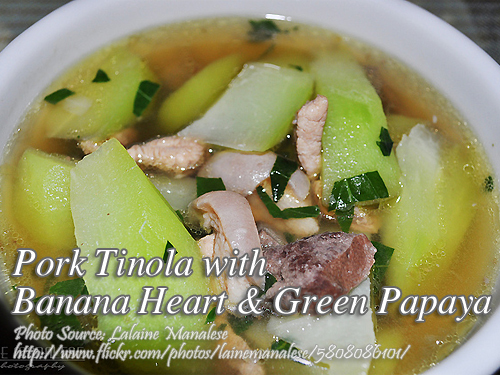 The only difference is the vegetables used in cooking the boiled pork because tinola is, as a usual ingredient used in the chicken dish is the green papaya. And also the banana heart which is not used in the chicken tinola, there is a technique in preparing it because it has a lot of sap. It is first sliced and soaked in brine (to release the sap) for a several minutes. Then you squeeze the the sliced banana heart and drain. Aside from pork, there are also other variation like the beef igado and chicken igado. To cook pork tinola; Saute garlic, onion and spareribs. Season with salt. Add rice washing and let boil. Simmer until the meat is tender. Add banana heart, green papaya and cook again for 8 minutes. Add sili leaves and cook 2 minutes more. Saute garlic, onion and spareribs. Season with salt. Add rice washing and let boil. Simmer until the meat is tender. Add banana heart, green papaya and cook again for 8 minutes. Add sili leaves and cook 2 minutes more. Serve hot. If you are okay, I would like to ask you a favor, please add my blog to your website. We have the same content food recipes. If you are interested please contact me. Thank you very much.